thank you fiber farmers for staying in business thru these hard times, when everybody's planting corn instead of hay for your animals. 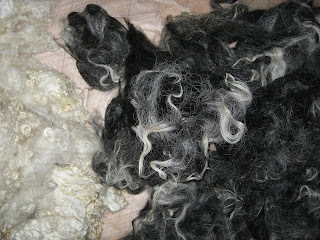 thank you for offering your gorgeous animals' sheared coats for sale. you make me happy! This is a book for all who love beauty and life! Start off with the physical aspects: it's a book that just makes you want to pick it up and see what's inside. The cover photographs, the book packaging, the typography! That luscious strip of dusty raspberry over on the left, the surprise of that deep wine endpaper. All gorgeous and intriguing. 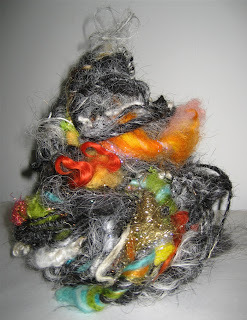 The thrill continues as you open it and realize that it contains TONS of color photographs of handspun yarn and projects made from handspun! Oh joy :) I am torn between wanting to rampage through the book and gobble up the pictures or be surprised as I studiously go through the book page by page. I can't stop myself...I must see at least a quick glimpse of the yarns! Ah...sated somewhat my brain settles down and will allow me to check the table of contents. 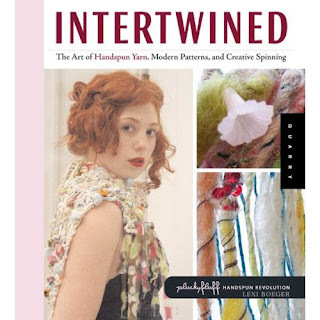 Hmm...The art of handspun yarn, modern patterns and creative spinning says the subtitle. The chapter titles travel from Lexi's thoughts on inspiration, excerpts from her journal, to talk about patterns and spinning. Along the way, there are close up shots of yarn, writing by others engaged in spinning and working with yarn, technique talk and a sprinkling of philosophical musings. This is Lexi's book, and she has generously made a space within it for many people to collaborate. It is rich with the stuff of today. Internet journal excerpts from the recent past make the reader aware that this book was written NOW. One reads between the lines to realize that many of the conversations that happen among spinners and yarn workers occur online among people who've only communicated by email. Back to the book! If you've been puzzled by a technique, there may be a take off point for you here. There are tons of step by step kinds of things with excellent diagrams for creating yarns. You will no doubt, be inspired to move beyond the recipe and improvise your own exotic creations. Lexi has been experimenting and creating yarns for quite a few years, and has introduced many to the idea of crafting their own damn yarn! If you don't make yarn, but prefer to work with handspun, you will probably gain insights on how to approach knitting, crochet, weaving and more with a playful attitude that really allows handspun to shine on its own or in combination with commercially produced yarn. Really, I don't think, after reading this book, that anyone will ever again say, "How do I use handspun yarn?". Intertwined is a modern classic, and you will keep finding new things in it every time you pick it up. So I hope you do "Pick it up!". Thanks to Lexi for taking time out of her life to share her thoughts and yarns with those of us who love her work and those who will come to know it through Intertwined!